The CityDoctor Validation Tool is our application software and contains the validation core module and an intuitive graphical user interface. A computer with Microsoft Windows and Java Runtime Engine Version 7 is required for the use of CityDoctor. 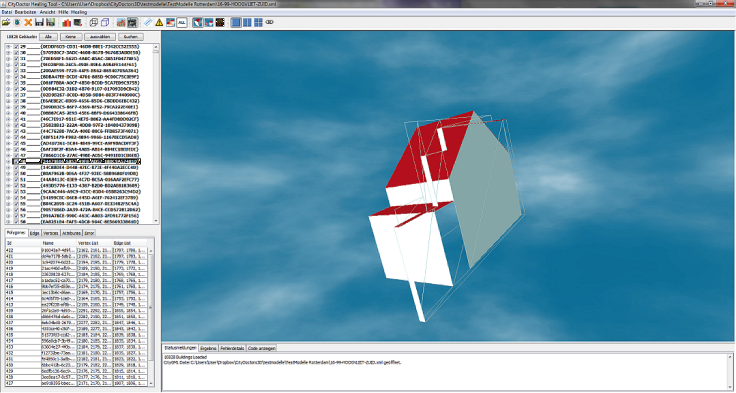 Optionally you can either view and check all building objects of a CityGML-based file or analyze a single building in detail. You can easily define and save a test plan where you can define which quality properties of your model you want to inspect. You also have the option of defining threshold values for validation. Errors discovered are explained in detail and can be saved for later use in a config file. Additionally, the deficiencies found can be visualized directly at the model and be highlighted. CityDoctor Validation Tool is available for free in a basic version for download after registration. Please appreciate that in this free version no additional support will be provided.